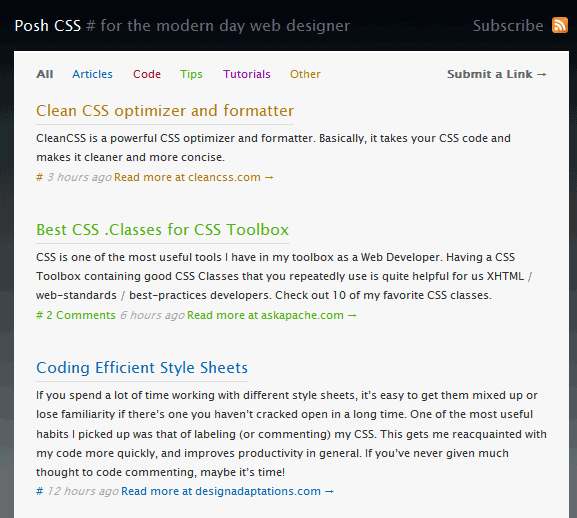 PoshCSS.com is a site by Massive Blue that has links to some really nice CSS Articles. I recommend subscribing to their RSS Feed so you don't miss any. Posh CSS is the brainchild of Sam Brown from Massive Blue who was looking for one central place to read about the latest and greatest techniques, tips and tutorials in the Cascading Style Sheet world. None existed and thus, Posh CSS was born.